Linear Monsters (A dream tench session). My recent trip to oxfords ‘Linear fisheries’ to do a week’s tench fishing unfortunately coincided with some recent unfavourable and very unseasonal weather. High pressure, north easterly winds and low overnight temperatures all played their part in putting a spanner in the works, to be honest I was going to call off the trip, but seeing as though I was heading down to meet ‘Dean Macey’ and have a good social as well as catch some big fish I thought sod it, you never know! Also I’d promised Amy I’d take my dog to give her a well needed holiday. Being a day ticket water Linear fishery tends to get very busy with carp anglers on weekends so arriving at 4pm on the Sunday gave me the best chance to be selective on which lake and swims I was to concentrate my efforts. 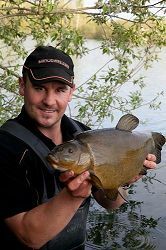 A phone call from fellow tench angler Dai Gribble confirmed that he’d just finished a 72 hour session on smiths/hardwick and struggled. 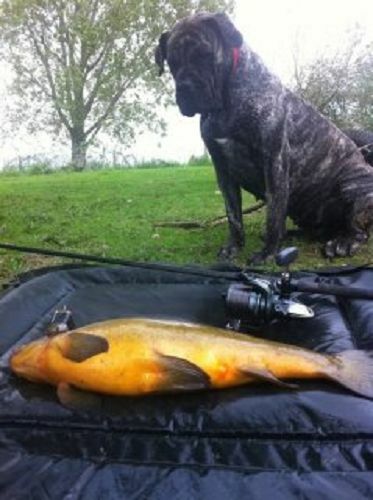 This came as a shock because as far as tench anglers were concerned Dai was up there with the best of them so if he was finding it hard what chance did I have? He did manage four tench to 8lb though so it was still encouraging. The area we chose to fish had a fairly strong south westerly wind blowing into it which had the fish rolling everywhere, most of which were carp but every now and then one of the lakes huge resident tench would give away its presence by sticking their backs out of the water ,followed by a quick splash of the tail, just to tease me I guess. This change in wind was a surprise as the weather man predicted different! Never the less we were both was happy. First cast with the marker float confirmed a depth of 8 feet and unbelievably it was weed free. The lake bed everywhere else was covered in Canadian pond weed so to find such an inviting feature so soon was excellent as well as a total fluke! As there were a few fish in the vicinity I thought some flavoured maggots (Sonubaits liquid pineapple) and half a dozen mini spombs of hemp n corn would kick start my session. Two rods were to be clipped up on the spot and cast every hour. My rigs were fairly straight forward consisting of large Drennan inline maggot feeders with 6’’ cammo braid in the gravel colour. 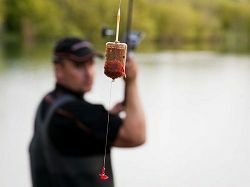 For the hook bait, rubber maggots would be setup on a maggot aligner via a D rig (sounds complicated but in truth once you’ve tied one it’s a piece of cake and very deadly). For the whole setup to work properly its vital the right choice of hook is used. I’ve experimented with various different patterns and come to the conclusion that in order to covert bites into fish on the bank the hook needs to be strong, very sharp and have a wide gape. Drennan’s new ‘specimen plus’ hooks match that criteria perfectly. With the business end sorted that just left my rod choice…. Having fished this particular lake before, I had first-hand experience with its huge carp that go well into the 40lb bracket. Couple this with double figure tench and thick weed you need a tool that can cope with linear’s demands hence why my recently purchased Drennan distance tench and bream rods were about to get their first trial run. They come with a 2lb test curve that would prove vital during my stay. I used shimano mini pits with 10lb Syncro mono to perfectly balance my stepped up tench setup. The first night was pretty quiet with just a few liners but after re- casting the rigs at first light I had a drop back resulting in a bream of about 8lb. the fish was bursting with spawn so my chances of a tench being in similar condition at the same time were slim. Usually the bream spawn well before the tench so this was a clear indication of the cold spell we were having. I had to wait until last knockings that same day for my next bite to arrive and when the line started whizzing off the spool I knew it could only be a tench or a carp. After a fairly spirited first run Deano and I both agreed it was a carp as its power and the fact I was playing the fish like a puff seemed to test my setup. We were both wrong as she rolled two rod lengths out to give us our first glimpse. The fish went in the net first go and Dean did the honours with the weighting to confirm a weight of 7lb 13oz. a very pleasing start to the season. Unfortunately that was it for the next 24 hours as far as my intended quarry was concerned. We did manage a carp a piece and a rogue pike that took a worm but the tench just wouldn’t get their eating heads on. It was weird and somewhat frustrating after seeing all those fish rolling on the Sunday afternoon but I suppose that’s gravel pit tenching for you. Wednesday morning dean had to head home as he had work commitments . I was gutted really as the sport had been slow for us both but the crack was good and we’d cemented our friendship whilst we were there. Future sessions were planned before we shook hands and parted company so all was not lost. By 10 am the wind was now moving round to a north easterly which was blowing off my back and it started lashing down! The banks were like a motocross track so I decided to bait up with another tin of hemp and corn and fire 15 balls of supercrush green out over my spot. The idea being to bait and wait. After all I’d not had much sleep and was still feeling the effects of Deans bottle of finest port so I wasn’t about to get wet and risk slipping into the drink…. My mid-morning snooze didn’t last all that long as just as I was dreaming away both rods started receiving liners…..big ones too. In fact the constant sound of my delkims bleeping away soon had me out of the comforts of my sleeping bag hovering over both rods waiting for a take. However ‘monster’, my loyal Presa, had different ideas choosing to stay indoors……..she knew the score! I waited and waited but nothing materialised. Just more liners! I needed to come up with a plan fast before my fingernails were reduced to stumps and my clothes reduced to wet rags. I figured there were a few tincas out there but they were being cagey. A change in tactics was needed to tempt one. I quickly put the kettle on reeled my right hand rod in and replaced the inline maggot feeder with a Drennan ground bait feeder. The hook link was attached via two braid stops helicopter style and this time the braid was replaced with ten inches of ESP ghost fluorocarbon and a size 8 super specialist hook. Instead of maggots as hook bait I’d changed to worms with chopped worms sandwiched between the ground bait in the feeder. It was a gamble but changes like this can change your fortunes. First chuck back in I was just taking the line out of the clip and setting the bobbin when the rod nearly got yanked out of my hands! I hadn’t even engaged the free spool yet either. The fish powered right past my marker braid on the spool, maybe ten yards or so but steady pressure and a bit of lady luck the culprit eventually came to the net. When I scooped her up I could clearly see she was in a different league to the last one. Her shoulders were huge. A proper Oxfordshire tench if ever I’d seen one! Surprisingly she was starting to fill up with spawn too. At 9lb 3oz I was totally over the moon. I’d waited a full decade to beat my old pb of 8lb 10oz and now my new pb was waiting in the net for photos, so with shaking hands I cast out again and made a call for ‘picky’ a mate I’d travelled down with to come n take some snaps. By the time he’d walked the short distance from one of the runs waters on the complex I was into another lump! Two tench bagged in a matter of minutes on worm! I couldn’t believe my luck. In hindsight it was a clear indication that my heavy baiting gamble had paid off. More chopped worm went out via the feeder and bites kept coming consistently. I finished the day on a high with six tench and one carp. The best being a new Pb …..RESULT! Despite being shattered after the previous days attack my alarm duly was set for a 4 30am start. With the kettle on the rods were cast back out as usual. I spombed out another tin of hemp and laced the swim with a further 15 balls of supercrush. Soon after the initial bombardment the green giants started rolling and the liners began. “Here we go again” I said to myself…… At 6 15am whilst knocking up a full English for me and the dog the fun commenced just like it always does when you’re busy cooking! Little did I know I was about to encounter the sort of tench fishing I could only of dreamt about. One by one they dropped their guards engulfing my worm offerings in the process. I was casting, playing fish, unhooking, and spombing. I went through about a kilo of dendrobaenas in a crack. The weights were taken down on my iPhone for future reference ……………. 7-13, 8-9, 8-8, 6-5, 7-10, 7-6, 6-12, 9-6(NEW PB), 6-15, 9-8(NEW PB), 8-10 and 6.0. Then at 6 15 that evening just as Stewart Moss from Drennan called in for a cupper on his way home from work I had an even bigger beast at 9-11! Talk about good timing. The initial run nearly pulled the rod clean out of the rest as I was fishing locked up so a hooked fish couldn’t seek sanctuary in the dense weed. ’Monster’ my canine companion nearly jumped out of her skin as I leaped of my bed chair like maniac. Soon after a heart stopping tense battle the second biggest tench I’d ever laid eyes on (thanks to my fiancée Amy………..long story lol) lay on the mat before me. Stew kindly took a series of great snaps and she was released fit as a fiddle to fight another day. The rods really did get a proper christening that day as a fair number of the hooked tench bored into a weed bed about ten yards from the bank. Had I’d been using my old Avon 1.75 TC barbel rods my results wouldn’t have been half as staggering. I would like to take the opportunity to stress how important balanced tackle and safe rigs are when fishing in waters like this where bigger than average size fish and weed are present. There really is no room for error as a tethered fish could end up a corpse and a’ trailer’ (a fish carrying a rig with trailing line)can causes endless problems catching other peoples lines and even worse wild birds. So strong gear throughout is the only way to tackle a venue of this calibre. I did manage a few more fish that night before darkness set in but to be honest I was exhausted and feeling the effects of severe sleep deprivation. So it was no surprise that I wound in at midnight and slept through two alarms the following morning. The remaining three days of my trip the weather became even more unsettled. A massive hailstorm on Thursday morning that lasted 10 minutes did nothing for my catch results. That’s what I was blaming anyway. I would still pick up a solitary fish every three hours or so on the worm but the sport had slowed considerably. Whether or not the bigger samples had wised up or they simply followed the ever changing wind and moved into a different part of the lake I’ll never know. I reckon over the course of my stay 90% of my takes came an hour after spodding in chopped worms. I don’t know if it was because they favoured them on this particular trip or if it was the fact I’d not followed the usual methods associated with tench fishing. One thing was sure my results outscored anyone else’s. By making little changes to rigs and baiting patterns I managed to get fish going again by the time Saturday evening came. After scaling down my maggot feeder size and lengthening the hook link a tad the maggot aligner started to produce a fish or two. No more nines or the double I was hoping for came to the net by the time it was the final whistle on Sunday but I didn’t care. I’d out witted 32 tench to 9-11 in crap conditions with the smallest being a male just shy of 6lb so I packed the van and set off back to Geordie Land with my head held high. I’d like to thank the guys who run linear fisheries for an action packed week in stunning surrounding and in particular James Drewett who couldn’t do enough to help me.